Proposed standardised cigarette packaging for the UK. Image licensed under the Open Parliament Licence v3.0. A crime wave fuelled by smuggling and a death sentence for small businesses — these are just some of the claims made by tobacco manufacturers in their campaign to keep standardised cigarette packaging out of the UK. Early results from Australia, which introduced the policy in 2012, have linked standardised packaging with a sustained increase in calls to Quitline, a reduction in pack appeal and a reduction in display of cigarette packs by smokers. This hasn’t stopped tobacco companies arguing that plain packs will be nothing but trouble, even when their own numbers don’t add up. Our Tobacco Control Research Group (TCRG) has repeatedly exposed the misinformation used by tobacco companies, lobbyists and astroturfing organisations. These are three popular arguments from the tobacco industry, and how our researchers debunked them. One of the most common arguments from the industry is that plain packaging will make it easier for smugglers to make counterfeit cigarettes. Tobacco companies claim that this smuggling boom would benefit organised crime and that additional income would finance prostitution, arms trafficking and terrorism. Dramatic videos produced by British American Tobacco showed the introduction of plain packaging leading to car bombs exploding on the high street and gangster shootouts amidst shipping containers. The reality is very different. The TCRG has exposed how the industry exaggerates the extent of tobacco smuggling by commissioning surveys whose methodology and validity remain uncertain, misquoting government data and planting misleading stories in the media. The group’s findings are supported by independent data from the Australian Borders and Customs Agency showing that plain packaging has not impacted the illegal trade of cigarettes. Smuggling cigarettes isn’t just for organised crime — tobacco companies have even been linked to smuggling their own products in order to dodge taxes and regulations. In 2000, tobacco company Philip Morris International (PMI) was sued by the European Commission for smuggling cigarettes into the EU. As part of the $1.25 billion settlement, PMI agreed to produce an annual report called Project Star about illicit tobacco in the European Union. The 2010 Project Star report concluded that 64.2 billion contraband and counterfeit cigarettes had been trafficked in the EU that year — a rise of 3.1 billion since 2009. Our researchers evaluated the report and found it was misleading, concluding that “its publication serves the interests of PMI over those of the EU and its member states.” They showed how the report overestimated the prevalence of contraband cigarettes and relied too heavily on their own ‘empty pack’ surveys, which weren’t independently verified. The ‘empty pack’ surveys can identify which cigarettes are domestic and which have come from abroad, but they’re unable to distinguish whether foreign cigarettes have been smuggled into the country or imported legally. The timing and location of the surveys can also skew the results dramatically — surveys in Germany over-represented border regions and locations near American military bases, where foreign cigarettes were significantly more likely to be found. Similarly, Imperial Tobacco cited a study commissioned by the Alliance of Australian Retailers which concluded that “retailing times would be adversely affected if standardised packaging were introduced by an additional 15 to 45 seconds per transaction and that the effect would be particularly significant for smaller retailers”. But the Tobacco Retailers Alliance and the Alliance of Australian Retailers were both created and funded by tobacco companies — a fact which the companies failed to mention in their submission. Our researchers reviewed 74 pieces of evidence on illicit and economic impacts of standardised packaging cited by tobacco companies in their submissions to the 2012 consultation. They found that the companies had failed to cite any independent, peer-reviewed evidence which supported their arguments. Nearly half the evidence cited was financially linked with at least one tobacco company, but the vast majority of these conflicts of interest were not declared in their submissions to the Department of Health. Despite a wealth of consistent peer-reviewed research and the independent Chantler review, which found that plain packaging is highly likely to reduce the appeal of smoking, tobacco companies keep arguing against this. But the evidence they submitted to the UK’s 2012 consultation on standardised packaging doesn’t stand up. The TCRG investigated tobacco companies’ critiques of the evidence for plain packaging and found that they misrepresented the evidence base for standardised packaging by misquoting and using a ‘mimicked’ form of scientific critique. Researchers also analysed 77 items of evidence submitted by four tobacco companies intended to prove that standardised packaging wouldn’t work. 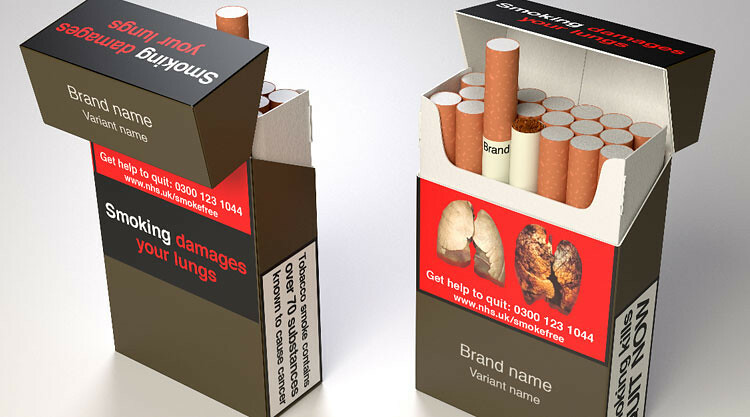 Their analysis found that only 17 out of the 77 items actually addressed the impact of standardised packaging. Of these 17, 14 were industry-funded, and none had been published in peer-reviewed journals. Our researchers submitted these findings to the Chantler review. “Our final communication vehicle with our smoker is the pack itself. In the absence of any other marketing messages, our packaging — comprised of the trademark, our design, color and information — is the sole communicator of our brand essence. Visit the Tobacco Tactics wiki to read more about our evidence on plain packaging. Our research in Social Work & Social Policy ranked sixth nationally by overall GPA in the independently-assessed Research Excellence Framework 2014. Research by the Tobacco Control Research Group was part of this submission. 84% of our impact in this area was deemed to be world-leading.